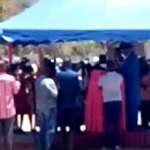 Former deputy governor of the southern Cunene province of Angola, Jeronimo Hailenge, was crowned king of the Ovakwanyama traditional community in Angola during a colourful event at the newly constructed palace in the Oipembe village near Ondjiva on Saturday. In his acceptance speech Haleinge thanked Ovakwanyama for putting their trust in him and promised that he will serve the traditional community with dedication. The latest developments in southern Angola are being followed with keen interest by Namibians as they may negatively affect future relations between the Ovakwanyama in Namibia and the Ovakwanyama in Angola. The coronation ceremony went ahead despite the Angolan government’s attempts to stop the proceedings following protests by a faction of the royal clan which accuses the politically well connected Haleinge of usurping the throne. A government delegation headed by deputy minister for culture, Maria da Piedade de Jesus, arrived in Ondjiva last week in a last minute attempt to stop the ceremony. However it went ahead but was mostly boycotted by government and ignored by the Angolan state media. After King Mandume Ya Ndemufayo’s demise in 1917, the Oukwanyama traditional community on either side of the border was without a monarch for over 80 years. The royal house was only restored after Namibian independence, but its jurisdiction was limited to the Namibian side of the border, leaving the Oshikwanyama-speaking Angolans without a monarch. It is alleged that the royal clan in Angola nominated retired police officer, David Lomboleni Mandume, to be crowned as the new king, but another faction of the community elected Haleinge. It is alleged that Haleinge is not a member of the royal clan and his coronation is therefore null and void, but his supporters say that he is indeed of royal lineage, from the line of King Haikukutu Ya Shinangolo who reigned from 1858 to 1859. What also raised eyebrows is that Queen Martha Mwadinomho Kristian Nelumbu of the Oshikwanyama-speaking community in Namibia was not invited to attend the event. She is however invited to participate on a round table discussion at Oihole village on 5 February and the 102nd commemoration of king Mandume’s death on 6 February. The queen’s trip to Oihole is now uncertain. The queen is scheduled to hold an emergency meeting with her advisers at the Omhedi palace on Sunday to analyse the situation and decide on the way forward. “The situation is very delicate at the moment and the possibility of Meekulu Nelumbu cancelling her trip to Oihole is not excluded,” said a source at the Omhedi palace.